Costa Rica is a playground for the adventurous. From surfing internationally recognized waves, to diving or snorkeling some of the best reefs, parks, and isles of the Pacific, to rappelling down waterfall canyons, crossing the jungle on a zip line rather than an ATV quad, the possibilities for exploration are more than abundant. Dominical Beach is one of the best surf spots of the whole South Pacific Cost of Costa Rica. Highly consistent, fast, and frequently barreling beach-break, it can hold serious size without necessarily closing-out. It tends to gets bigger and faster near the Rio Baru river-mouth, but broken boards are frequent and near-drownings may happen here. Ideal for beginners and intermediate surfers for its consistency when conditions are not extreme, Dominical Beach tends to get seriously challenging and better indicated for experienced surfers when sized swells get in. On these occasions, a few “easier” spots are located just a few minutes’ drive from the Hotel: it is almost a fact that, between Playa Dominicalito, Playa Hermosa, and Playa Colonia, one can find a "good window of opportunity" for his/her surfing ability, and enjoy a couple of hours of good surf. Please feel free to ask our staff for support, suggestions, and indications. High tides normally accompany more gentle and less steep waves, and should be the preferred conditions for non experienced surfers. This hold particularly true for Playa Dominicalito where a few rocky formations make high tide surfing almost a must. The "best" conditions for Dominical Beach are normally on "incoming tide", from mid to high tide (the lower the tide, the hollower and faster the waves), possibly early in the morning or late in the afternoon. Dominical hosts the offices of a number of surf schools that can provide very professional courses and lessons directly at the Dominical Beach Break or at one of the nearby spots, when prevailing conditions indicate so. Listing all of them here would be too long (and would entail the risk of forgetting to mention - or not mentioning properly - one or more schools). For this reason, and also as a reward for their business, we mention (in strict alphabetical order) the schools that have historically hosted at our facilities more of their customers: Costa Rica Surf Camp, Dominical Surf School, Dominical Waverider, and Sunset Surf Dominical, and invite you to Google the Internet for additional information on surf schools in Dominical. It is widely recognized that a proper Yoga routine provides exceptional benefits to surfers, both mentally and physically: more focus, better confidence, firmer balance, higher energy, longer endurance, more vitality, flexibility, longevity and, last but not least, performance. 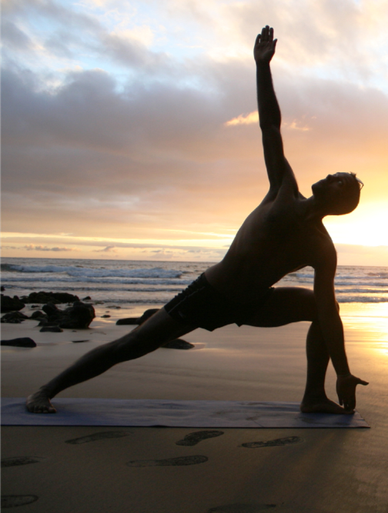 And Yoga also helps to strengthen those specific body parts that are key to surfers in the practice of the discipline (arms, legs, back and wrists), whilst minimizing the risk of injuries and improving recovery after sessions. Even beginner and intermediate surfers should commit to perform (even a few) specific stretches and techniques both before and after the surf session, also to improve their paddling potential and stand up technique. Either at one of the professional schools with offices in Dominical, or directly on site with a private instructor, please feel free to ask more about rates, availability, and organization. Just some 20 kilometers South of the Hotel, is the Marino Ballena National Park, one of the least explored marine beauties world-wide, that develops around a wide reef system (some 70 kilometers in length) made of rock pinnacles, reef walls, sea mounts, and islands. Among these, some 40 mile at sea, just in the middle of pristine turquoise waters, lies the Caño Island, regarded by several experts as the best scuba diving spot in the entire country. The underwater visibility of the whole area is just amazing (typically exceeding 20 meters), and an enormous amount of marine species can be encountered in their natural environment: manta rays, tunas, needle fish, barracuda, snapper, white-tipped reef sharks, sea turtles, moray eels, dolphins, and whales. The Park is a biological reserve, and diving numbers are regulated: there are 5 dive sites, and only 10 divers are allowed to be in the water at one time, guaranteeing to the experience the aura of "peacefulness" that it sincerely deserves. 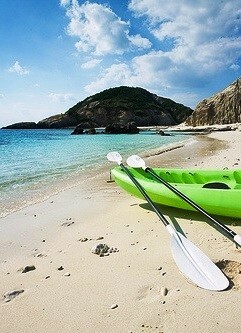 Stand Up Paddle Boarding is an easy and healthy water sport that constitute a great work activity for the whole family. Either a relaxing paddle along the nearby Baru River, or a fascinating paddle towards “Punta Uvita” (whales tail), or a wild one along the Terraba-Sierpe mangroves (the biggest in Central America), Dominicalito or Ventanas Beach, ... you just have to choose the destination, and the experience will for sure be worth the time ... and the paddle. 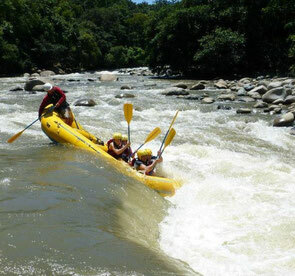 If in mood for a more adrenaline rich adventure, Water Rafting is then for you. With a wide selection of nature rich rivers to choose from, in any season and for any level of experience, the Dominical area is the most indicated bases from where to explore the waterways of the Osa peninsula and the South Pacific Coast. From the easy approach at the Savegre River, to the more demanding Coto Brus and Guabo River, up to the "sofisticated" rafting along the Chorro River, the choice is up to you. Start easy, we suggest, get to know the discipline better, have fun, and - in case - book your next level rafting experience right at the end of the one you just completed! Stay safe, have fun! 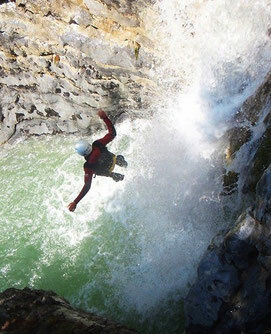 Canyoning is a great nature immersed and adrenaline rich experience that involves rappelling through waterfalls. The discipline in itself is quite easy (although height intimidated persons should think twice before committing to the experience). Participants do get soaking wet (remember that you are practically jumping here and there through waterfalls - which is the most fun part of the experience), and therefore need to leave for the tour with proper shoes, and dresses (including "dry spare parts"). Normally, one Canyoning tour involves more than one cliff (3 to 4): each cliff has its unique features and is an experience in itself. All in all, lots of fun are guaranteed! With plenty of coastlines, rivers, creeks, and estuaries around, one of the most exciting ways to explore the whole area of Dominical and the OSA Peninsula is by Kayaking. Kayaking makes it possible for the visitor to view and explorer the beautiful nature of Costa Rica "from a different perspective" and wonder at things that would pass unnoticed from land. 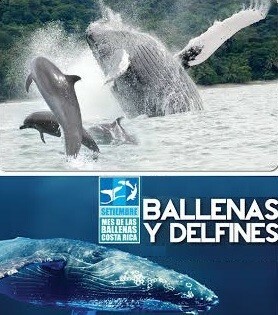 From the relaxed navigation of the calm waters of the Baru and the Morete River, to the "intricated" navigation of the Hatillo Mangroves and its Jungle forest, to the open navigation out of Dominicalito Beach, the Ventana caves and the Whales Tail, it is up to the visitors' preferences to decide the destination. Just a 15 minutes drive South of the Hotel, the Marino Ballena National Park covers an extension of 110 land hectares and 5,375 sea hectares. The Park pertains to the Area of Conservation for the Osa region and was officially declared as a Marine National Park in 1989. The park provides shelter to the humpback whales that, from mid July to October, and again in December through March, migrate from feeding and mating grounds in the North and South hemispheres to the warm tropical waters of Costa Rica. The Marino Ballena National Park is comprised of golden sandy beaches, rocky shorelines, cliffs, islands, mangrove ecosystems, rock and coral reefs. The most prominent land formation in the park is the Punta Uvita Whale Tail, a sand bar that extends 1 kilometer into the Pacific Ocean. At low tides, visitors can walk out to the Punta where the rock reef stretches out forming the shape of a whale tail. 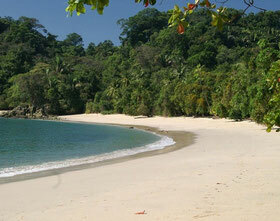 The Marino Ballena National Park is home to one of the most biologically diverse marine habitats in Costa Rica. Marine birds such as pelicans, brown booby and frigates can be observed on the islands and rocky formations. 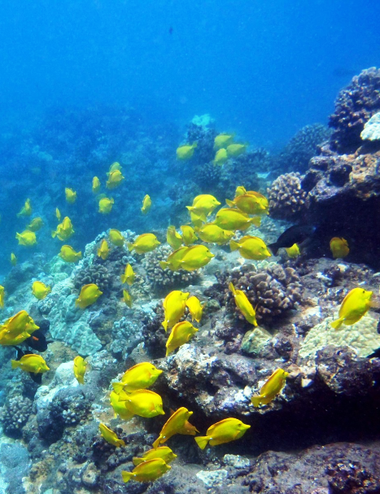 Approximately 70 species of fishes, humpback whales, brydes, orcas, spotted, spinner and bottle-nose dolphins, sharks, crabs, starfish, lobsters, sponges and mollusks, form part of the diverse marine life found in the Park. The Park contains 18 different coral species making it one of the best snorkeling places to observe corals, second only to the nearby Cano Island Reserve. Together, the Marino Ballena National Park and the Cano Island Reserve make for the best Costa Rica snorkeling and diving destinations. Not more than 1 hour drive South of the Hotel (by boat access from Sierpe), the Corcovado National Park will be able to impress your mind and soul and will make you experience the real Costa Rica jungle. Visitors will have the opportunity to hike through the lush rain forests of the Park and to spot an incredible amount of biodiversity that average tourists would think impossible in a limited amount of time. Within the park, some 600 insects species, 375 birds, 6 felines, 67 amphibians and reptiles, and 4 different species of monkeys have been identified. Not only the Park is the home for a wide variety of wildlife and over 1500 species of trees, but it also represents a shelter for many endangered species such as the tapir (Tapirus bairdii), the white lipped peccary (Tayassu pecari), the giant anteater (Myrmecophaga tridactyla), the silky anteater (Cyclopes didactylus), and the jaguar (Felis onca). 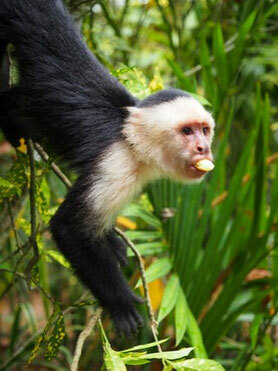 A visit to the Corcovado National Park is perfect for biologists, students, or nature lovers of any kind. Visitors to the Park are normally recommended to bring with them hiking shoes, bathing suit, rain coat (in case of rain), binoculars and camera, sunscreen, insect repellent, and extra clothing. Just 1 hour drive North of the Hotel, the Manuel Antonio National Park will bring you one of the most impressive landscapes in the world, with many coves and lots of white sand beaches lying between great mountains with incredible forests, and beautiful coral reefs extremely rich in biodiversity. The ease of access to the Park (it is really close to the super active city of Quepos) and the wide range of flora and fauna available in such a small place, has made it one of the most visited parks and one of the most famous tourist destinations in the country. Although this should not detract to the beauty of the Park, it should remind visitors to re-discover the fascinating spirit of laid back destinations, and never forget to respect the environment at the best (however "famous", the diversity of the Park wildlife is still unequaled, with more than one hundred species of mammals, two hundreds species of birds, two different species of sloths, three different species of monkeys, several of iguanas, snakes, and bats). A possible visit to the Chirripò National Park from the beach town of Dominical exemplifies the incredible biological and geographical diversity of Costa Rica: a Country where one can move from coast to coast (Pacific to Atlantic / Caribbean) in the day. The Park, encompassing parts of three provinces (San José, Limón and Cartago) is named after its highest peak, the Cerro Chirripó which, at 3,820 meters (12,530 feet), is the highest mountain in Costa Rica. The park consists of primary rain forests, primary cloud forests and, above 2,740 meters (9,000 feet), wet desert, and has been categorized to host five distinct ecosystems. Reaching the Chirripò summit is possible but a reasonably long track is needed, starting with a 16.5 kilometers (10.3 mile) uphill trail from the San Gerardo de Rivas to the park ranger's refuge in the Los Crestones sector, followed by a 5 kilometers (3.1 miles) walk to the peak. 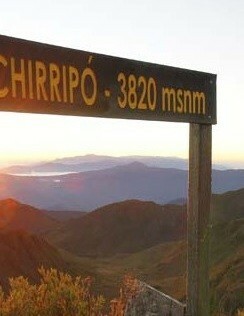 It is recommended to approach the Park and its peaks only accompanied by professional and enabled guides. Just a couple of minutes drive North of the Hotel, the Hacienda Baru started to operate in the area during the first seventies to gradually transform what was a working cattle ranch into a National Wildlife Refuge and Lodge. The Hacienda shelters an impressive biological wealth and hosts a wide variety of habitats, from wetlands to primary and secondary forests. The Hacienda offers visitors the possibility of exploring the area with guided or un-guided tours, including the beautiful butterfly and orchid gardens, the bird watching tower, and a number of self-paced trails within the Hachienda. Guided tours range from "simple" explorations of the mangrove or the rain-forest, to twilight hikes and whole night stays in the Jungle, rather than an exceptional tree climbing experience. 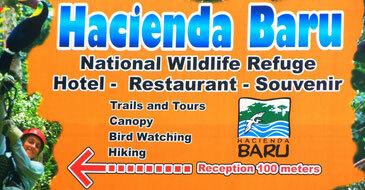 The Hacienda is home to a well sized zip-line, souvenir shop, restaurant, and Hotel. A short 15 minutes drive East of the Hotel (in the direction of San Isidro del General) leads to the farm where the waters of the Río Barucito flow over two vertical drops forming the wonderful Nauyaca Waterfalls. The taller fall is 45 meters (150 feet) high in free fall, whilst the other fall is 20 meters (65 feet) high with a tiered fall, forming at the bottom a spectacular pool, 1,000 squared meters (10,000 squared feet) wide and 6 meters (20 feet) deep. 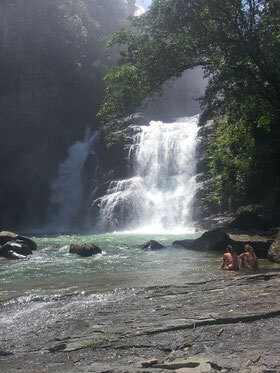 These beautiful waterfalls, together with a number of smaller natural pools located within the farm, are a natural play ground where to climb, jump, swim, horseback ride or just have good times together with friends and family, while staying immersed in the beauty of the tropical rain-forest. The farm and the Waterfalls can be visited either by hiking or by horse back riding. Included in the tours, visitors can have breakfast and lunch directly at the farm. 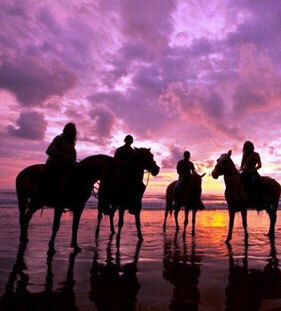 Horse back riding is for sure a very effective way to explore the fascinating nature of Costa Rica South Pacific Coast, from an energizing gallop on the beach, to an adventure rich trail through the tropical forest and its lush jungle life. From the back of meticulously trained and carefully controlled horses, visitors will have the opportunity to visit Playa Hermosa, adjacent to the Marino Ballena National Park, ride toward secluded waterfalls where to take a refreshing dip, or enjoy an astonishing sunset. Horse tour operators try to keep groups of visitors reasonably homogeneous and limited in number so that an enjoyable experience can be provided to beginner, intermediate as well as experience riders. Some 10 minutes by car South of the Hotel, just after Playa Dominicalito and via a short drive in the jungle through an unpaved road (easily accessible on 4WD during the dry season), the Villas Alturas Wildlife Sanctuary offers visitors a rich variety of the amazing Costa Rica wildlife. 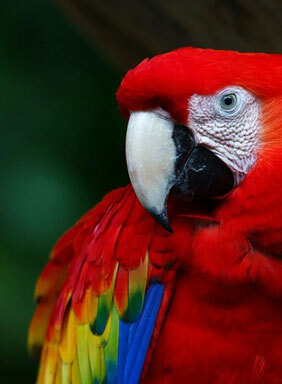 The mission of the sanctuary is to rescue, rehabilitate and either release back to nature or give shelter within the sanctuary (in case animals cannot return to nature because of disability, injury or severe over-domestication) to those animals that the government of Costa Rica confiscates from any illegal situation (illegal pet trade or domestication) and those abandoned or orphaned animals that were injured but succeeded to survive. The type and number of animals hosted at the sanctuary varies constantly, providing the opportunity to discover different animals from month to month. Visitors can schedule accompanied tours with the Sanctuary operators to get educated on and interact with the amazing animals finding shelter here. Canopy tours are for sure a very good way to experience the paradise of Dominical surroundings by zip lining over the tree tops of its magical rain forest. 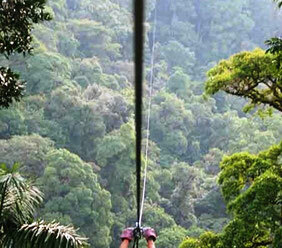 A canopy tour is a great eco-adventure for the entire family. The majority of tour operators specify a minimum age of ten years of age for participants. There is also a weight restriction of about 120 kilograms (265 pounds) on most canopy tours. Individuals scared by heights may not be the best candidate for a Canopy: some platforms and bridges can reach considerable heights above the forest floor and once the tour has begun it can be difficult to turn back. The topography of the South Pacific Coast of Costa Rica, with its lush mountain trails, unspoiled jungles and pristine beaches just minutes apart, makes it a very well indicated location to be explored by ATVs (All Terrain Vehicles, a.k.a. "Quads"). 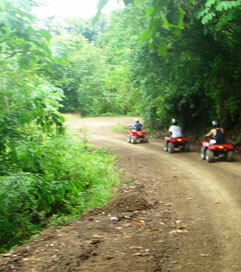 ATVs offer visitors a safe and yet adrenaline rich way to access some of the most secluded and magnificent landscapes of the South Pacific Coast. ATV operators organize their tours so that frequent stops are made to give participants the opportunity of swimming, jumping off a waterfall, eating, drinking, or just relaxing while enjoying the spectacular views that only the South Pacific Coast can reserve to its visitors.